Holmes Hammermill Coal Crushers reduce bulk samples of coal and coke with rotary-swing hammers. The enclosed cases, covered feed hoppers, and rugged cast iron housings ensure safe and efficient operation with low maintenance. Feed hopper gates enable manual feed control. Hinged and latched housings offer quick access to the grinding chamber for cleaning and replacement of the bolted-in screens. The open-latch sensor cuts all power for increased safety and rotors, swing hammers and screen plates larger than 3/16in (4.8mm) are heat-treated and hardened to promote maximum service life. Spring-loaded clamps help seal sample collection containers to discharge spouts for dust control during operation. Units are mounted on four casters for easy relocation in the lab. A special control box with NEMA 12 magnetic starter and over-load protection is standard, and wiring is 230V/60Hz, 3-phase. Inquire for other electrical and wiring options. 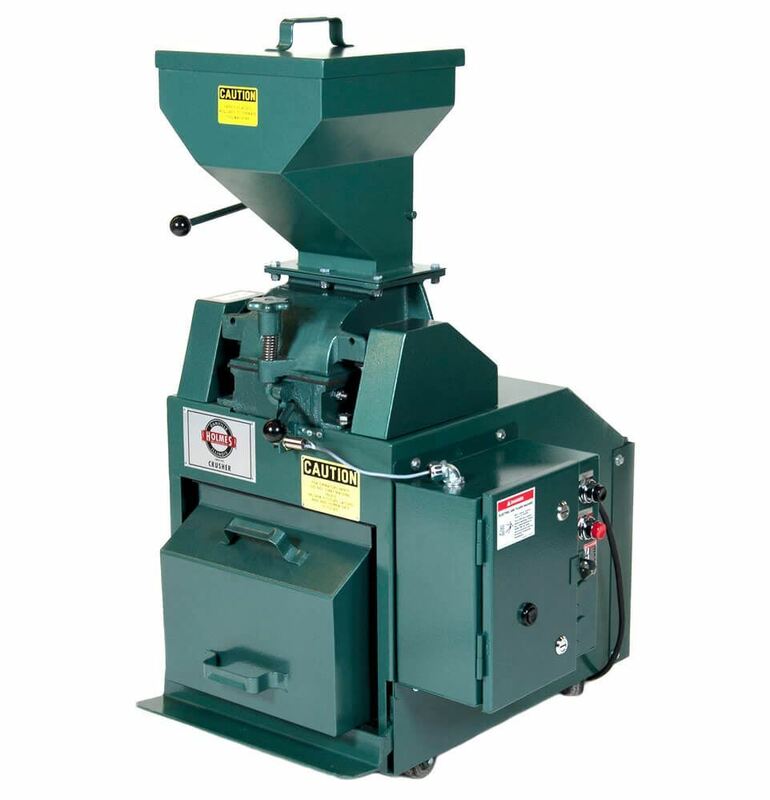 LC-201 Small Holmes Hammermill Coal Crusher is recommended for crushing 2in (51mm) and smaller samples. It processes at a maximum rate of about 1,000lb (454kg) of coal material per hour. Final size is approximately 1/16in (1.6mm) and rotor speed is 3,450rpm. 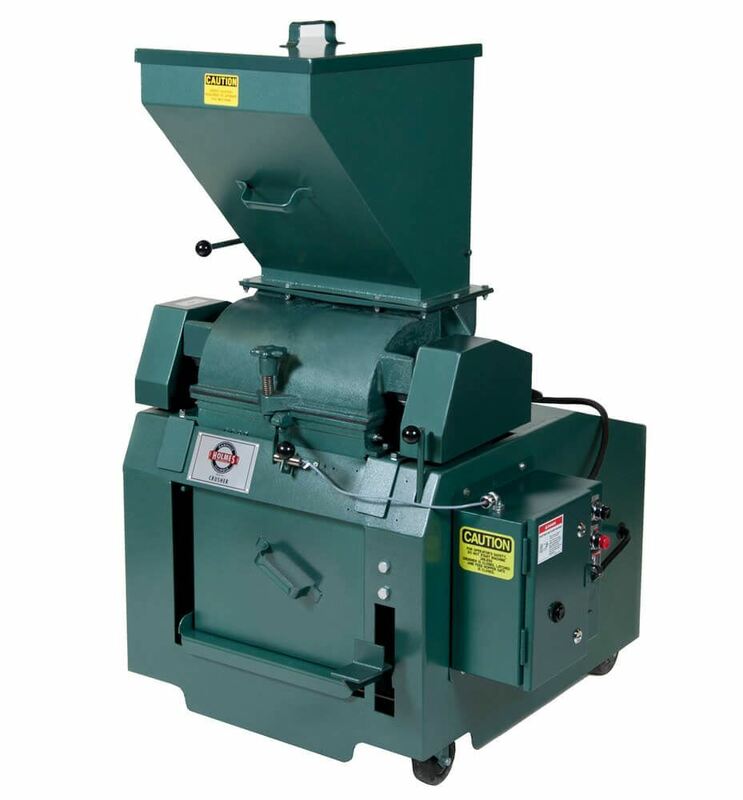 Covered Feed Hopper capacity is 0.40ft³ (11.3L), and crushing chamber is 7x6in (178x152mm). Powered by a 2hp TEFC motor, and has a standard rotor speed of 3,450rpm. 3/16 and 1/16 (1.6 and 4.8mm) Screen Plates with round-hole perforations are included. Additional Screen Plates can be purchased separately with opening diameters of 1/16, 3/32, 1/8, 3/16, 1/4, 3/8, and 1/2in (1.6, 2.4, 3.2, 4.8, 6.3, 9.5 and 12.7mm). The LC-201 also comes with two sample collection containers and a 10ft (3m) cable for connecting to the power source. The rotor assembly is end-to-end reversible, offering maximum hammer life. Select plates from drop-down box above when ordering. LC-401 Large Holmes Hammermill Coal Crusher is designed for larger feed sizes up to 6in (152mm). Maximum throughput is approximately 4,000lb (1,814kg) per hour and final sizes range to 3/16in (4.75mm). Standard rotor speed is 1,260rpm. Powered by a 7.5hp TEFC motor. Screen Plates are available in round-hole perforation diameters of 1/8, 3/16, 1/4, 5/16, 3/8, 1/2, 3/4, and 1in (3.2, 4.8, 6.3, 8.0, 9.5, 12.7, 19.0 and 25.4 mm). The covered feed hopper capacity is 1.6ft3 (45L). This model also features end-to-end reversible rotor assemblies offering a maximum hammer life. It includes two screen plates in customer-specified diameters, sample collection container, and a 10ft (3m) cable that connects to power source. Select plates from drop-down box above when ordering.